What is Lent? By most popular definitions lent is a period of abstinence, total or partial, from food. It is basically a diet. If it is not understood as a diet, then is often considered a period of renunciation to some of our guilty pleasures like TV, chocolate etc. 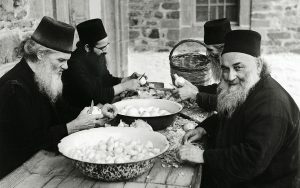 The Christian understanding of fasting however and especially the Orthodox one, is much more complex than simply “giving up” something . So what is Lent? Of course during Lent we renounce some types of foods like meat, dairy products etc. This is an important part of our lenten journey, not to be forgotten or neglected; it helps the body become swifter and, less encumbered by heavy foods, it can rise faster to prayer and other soul enriching activities. Abstaining from food, although absolutely necessary, is not a goal in itself, but just a gate to greater things. Fasting is first and foremost an attempt to live, even if for a short period, closer to perfection, to the Christian ideal; it is a return to the basics of humanity before the fall. In Paradise Man was not concerned with food and the matters of the body. The purpose of his existence was to advance in the grace of God by remaining close to Him, trusting completely in His loving care. What came with the fall was loosing sight of this dependence of God and becoming over-concerned with the matters of the body, to a point when they completely suffocate his entire existence. Lent is an exercise meant to help us break free from these bonds of material necessity so we could redirect our efforts towards spiritual development. This involves separation from the world (understood as passions) through fasting completed by a more rigorous preoccupation with reaching a closeness to God through the Christian works. A complete Lent rests on three pillars: fasting, prayer and almsgiving, uncovered by Christ Himself in the sermon on the mountain (see Mathew 6:1-18). Fasting is not meant as competition but rather as a private matter, an intimate achievement that ultimately helps us rediscover who we are and how we relate to the others and with the entire material world. The ascetic exercise of lent replenishes the meaning of things that might be taken for granted. If one abuses even the most thought after food for example, after a while it becomes mundane, unsatisfying, not appealing anymore. If one fasts for a time however, when even the simplest of foods are tasted again, they recover their original taste, texture, flavor and we are able to enjoy them again. Same goes for everything we abstain from during lent according to the ancient teachings of the Church. This is one of the great rewards of fasting that can only be understood through personal struggle. The alms are an evidence of our love for God expressed through the love of our neighbor. On our love for God and on the love of our neighbor rests the entire law of God. (Mat. 22-40). One cannot love God without loving his neighbor who is made, just like ourselves, in God’s image. Honoring Him we honor God. Many times though, the purpose behind almsgiving can be derailed to its demise. Some may give so others can see them and applaud, others to achieve some kind of worldly status, or just to show superiority. Thus all their efforts are in vain and their reward temporary, loosing the greater prize awaiting in heavens. Almsgiving, like fasting, should be part of our personal journey to God, that should be accomplished for the sole purpose of getting us closer to Him through the fulfillment of the commandment of love. It is about us, learning how to love, how to care, how to be more sacrificial following the example of Christ Who sacrificed everything for us. It is us becoming more Chris-like. That’s why has to be a private affair, not a boasting opportunity. Beside the most known prayer of Christianity, the Lord’s Prayer, we discover here that just as fasting and alms, prayer is a personal conversation with God. Prayer is not about shouting our love for God in the streets but shutting the door of our hearts and finding God there, in the silence of a simple prayer. This makes prayer a very private affair and an experience difficult to share. This is why whenever asked how to pray the Holy Fathers rather gave a command than an explanation: “Pray and the prayer will teach you how to pray”. 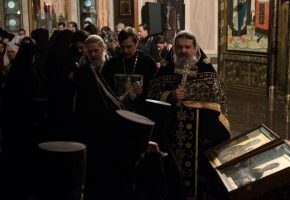 This is not to say that we shouldn’t participate in community prayer, by the set rules of the Church Typicon, the Great Lent gives us plenty of opportunities we should participate in, this is to invite us to take an extra step in our personal encounter with God, in the privacy of our icon corners at home. Here, unhindered by the regards of other people, we can uncover another important aspect of prayer particularly underlined during Lent: the importance of involving the body in prayer. Man is not just spirit but also body, so to pray earnestly, to pray with your entire being means to get the body to pray also through kneelings, prostrations, standing etc. 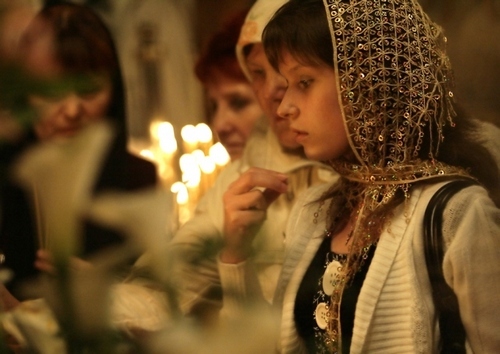 In this way the whole man participate in the glorification of God by taking part in the ascetic struggle. A house is more stable with four columns. Therefore to the three pillars above, for added stability, we should add a fourth one: repentance. Jesus Christ spoke about Repentance at the very beginning of His missionary activity. The reason why is simple: we can’t get on the road of perfecting ourselves in the New Covenant with the same baggage we were carrying in the old one, there has to be a change. Repentance helps us get rid of our baggage of confusion, misunderstandings, trespasses, uncertainties, unhealthy attachments and so on. This involves careful examination of conscience based on the commandments of Christ through participation in the mystery of Holy Confession, another personal and private encounter with God. Confession is a truthful reflection of us just as we are, not as we imagine ourselves to be when we glance into the mirror in the morning. Confession is about taking the courage to trust someone (God, not the Confessor who is just a witness) so much that you can be vulnerable and show your not so glamorous side. This is the only way to progress, to know as weak we are as men so we can become stronger in Christ. When we raise from Confession, unbothered by the weight of our conscience and receiving the necessary guidance for our journey, we can look now with hope to a future that rises up to God. Failing to receive this Mystery is like refusing to ask for directions in a foreign land: one might find the road by chance, but the odds are slim because our load is heavy and the road is treacherous and full of enemies. Fasting, almsgiving, prayer, repentance. These are the basics of our life in Christ that we should act upon at all times, not just in Lent. Lent is like a boot camp, a concentrated effort that should develop our taste for a higher responsibility to our spiritual development. We are not saved by them alone, but they help us be more receptive to the grace of God, to understand Him more not just through intellectual exercise but through direct participation. After all Lent is an a journey to an intimate encounter with God that happens not in far away galaxies, but right in the center of our being: the heart. Through its various therapeutic means Lent helps mediate this encounter and restore us in the grace of God. The journey of Lent is a journey of personal re-discovery, is a return to our formal selves, is personal quest to regain our formal glory lost through sin and self-centricity but regained through virtue and charity accomplished by union with Christ.